Combed Cotton Jersey Shorts for Women. Made in the USA. Combed 100% Cotton Jersey LONGER Shorts for Women Made in USA by ICanToo. Stay cool with the supreme comforting softness our well-loved Pedal Pusher Combed Cotton Jersey Shorts for your summer activities. It has side slash pockets and a comfortable soft elastic waste band. Just above the Knee length with approximately 11" inseam. These are as comfortable as wearing your favorite Tee shirt as shorts! Be sure to check the Size Chart below for the Modest Women's sizes S, M, L, XL. Made in the USA. Average Waist Size 34-36" 36-38" 40-42" 44-48"
A: Relaxed Waist Circumference, measured w/o pulling waist band tight. 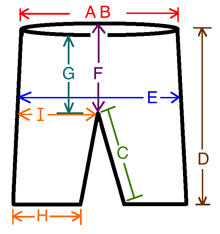 27" 28" 29" 30.5"
B: Pulled Waist Circumference, measured pulling waist band as far as possible 40" 40" 42" 43"
C: Inseam: Crotch to bottom of hem 11" 11.5" 11" 11"
D: Outer Seam: Waist to bottom of hem 21" 22" 22.5" 23"
E: Hip Circumference: measured around widest hips (8" down from waist band) 41" 42" 43" 46"
F: Back Rise: back waist band down to crotch seam 15.5" 16" 17" 17.5"
G: Front Rise: front waist band to crotch 11" 12" 12.5" 13"
H: Leg Hem Circumference 9" 9" 10" 10.5"
I: Widest Leg Hip: Widest part of hip fabric from crotch to side seam 11.5" 12" 13" 13.5"